1976 $2 Bill Value | What's It Worth? The United States two-dollar bill is a popular form of currency that is still in circulation. It is considered the United State’s rarest small denomination currency, which is why most people believe it is a collectible item. But how much is a 1976 $2 bill worth? Read on to find out. The United States two-dollar bill is a legal tender note that was first issued in March 1862. The 1862 note featured a portrait of Alexander Hamilton in profile view on one side (different in appearance to the portrait on the current ten-dollar bill). it was marked as a “United States Note”. The two-dollar bill was redesigned in 1869 to feature the familiar portrait of Thomas Jefferson with an image of the United States Capitol on the other side. This note also had green tinting on the top and left side of the note. This is the first two-dollar bill to feature the words “Treasury Note”. The next revision occurred in 1874, when a red floral design was added around the words Washington D.C. The words “Treasury Note” were also changed back to “United States Note”. This design was also issued in 1875 and 1878. In 1880, the design was changed again, with the red floral symbol being removed and the serial numbers being changed to blue. The next major change was the Educational Series issues in 1896. This series featured allegorical tributes to science and portraits of visionaries including Robert Fulton and Samuel F. B. Morse. These beautiful notes are highly sought after. In 1899, this design changed to show allegorical tributes to agriculture and mechanics, along with a portrait of George Washington. These early “United States” issued two-dollar notes are very valuable. The Federal Reserve Act of 1913 authorised the issue of federal reserve notes, including two-dollar bills. Subsequent two-dollar bills would feature the words “Federal Reserve Bank” on them. The first Federal Reserve two-dollar notes were produced in 1918. They were larger than normal two-dollar bills, which made them easily distinguishable from early “United States” notes. These notes featured a [portrait of Thomas Jefferson on one side and an image of a WWI battleship on the other. In 1928, the sizes of U.S. currency were standardised to 6.14 × 2.61 in (156 × 66 mm). At this point, the two-dollar bill was only issued as a “United States” note once more. This note had a cropped version of the Thomas Jefferson portrait from previous notes. On the opposite side, it featured an image of Jefferson’s home (called “Monticello”), and red serial numbers. The next major design change occurred in 1953, when the note was made to look more like the five-dollar bill. Changes included the treasury seal being resized and the United States Note obligation being moved. The last change to this series occurred in 1963, when motto In God We Trust was added. All “United States” $2, $5, and $100 notes were discontinued in 1966 although they remained legal tender. By the 1950’s the production of two-dollar bills began to decline. As they became scarce, collectors began to save any two-dollar bills that they saw, which made them even rarer. The two-dollar bill was reintroduced in 1976 as a part of government cost-cutting measures. They were redesigned and issued as a “Federal Reserve Note”. A federal reserve note is issued by the federal reserve, the nation’s central bank. This is a privately owned and directed bank for the most part. This differs to earlier notes which were produced by the treasury department. In terms of appearance, the main difference is that the words above Thomas Jefferson’s portrait will say either United States Note (pre-1966) or Federal Reserve Note (post-1966). The United States note will also have a red seal on the front if it, located above the word “Two”. The United States notes are being taken out of circulation and are quite rare, which makes them more valuable. The federal reserve two-dollar bill can still be obtained today. When the 1976 two-dollar bill was introduced, thousands of collectors rushed to obtain them. In many cases, the first day releases of the bill were taken to local post offices by collectors to be stamped with the release date “APR 13 1976”, which give them additional authenticity. These stamped 1976 two-dollar bills are worth more than bills without a stamp. The design of the 1976 two-dollar bill included the same image of Thomas Jefferson that has been on all two-dollar bills since 1928. It has a green serial number and treasury seal, which is different to the previous bills that used red ink. A rendition of John Trumbull’s Declaration of Independence replaced Monticello on the opposite side of the bill. 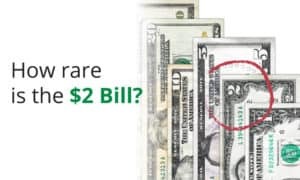 How rare is the two-dollar bill? From the 1950’s on, two-dollar bills had low printing numbers. This has resulted in the two-dollar bill being the rarest current denomination in the United States. At this time, about 1% of all notes in circulation are a two-dollar bill. The rarity of the bill is why so many people believe it is highly valuable. In recent years, the two-dollar bill has been printed in greater numbers. In 2005, 61 million two-dollar bills were produced, which is double the amount produced between 1990 and 2001. Interestingly, the increase in the bill’s popularity is suspected to be driven by strip clubs and poker rooms. The owners of these types of establishments prefer to give change in two-dollar bills as it results in larger tips. 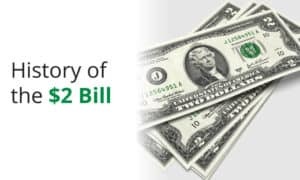 What is the estimated 1976 $2 bill value? 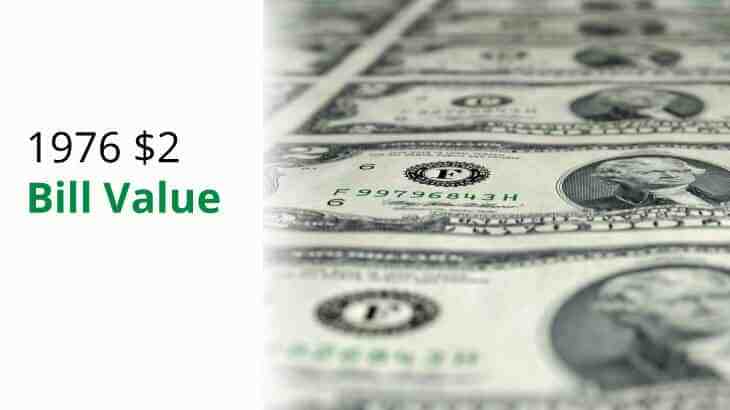 In most cases, a pristine 1976 $2 bill is worth slightly more than face value ($2 to $3). However, it might be worth two or three times face value ($4 to $6) if it has an interesting post office stamp on it. Two-dollar bills produced between 1953 to 1963 are typically worth about $4 to $6. Two-dollar bills produced from 1928 to the 1950’s can be worth anywhere between $10 to $30. Older bills can be worth much more.